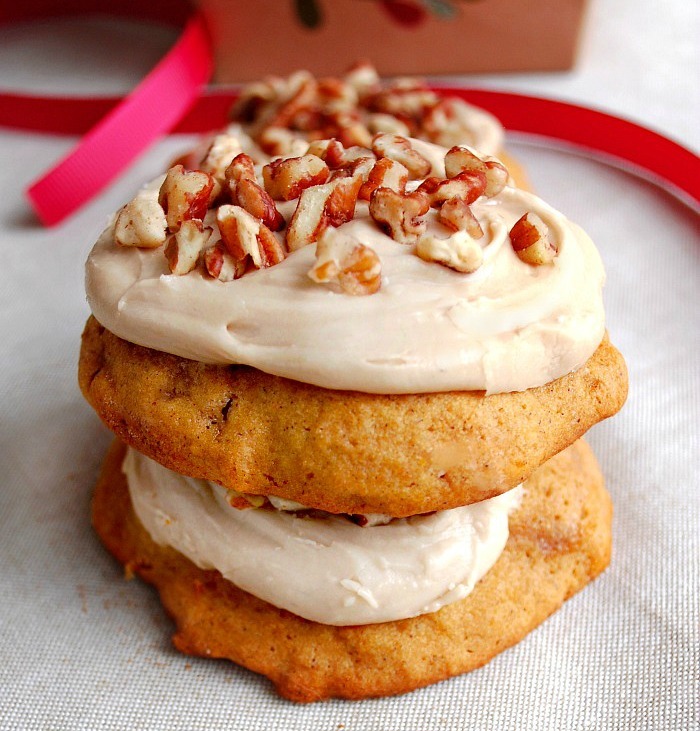 Pumpkin Cookies with Penuche Frosting – you’re going to love these soft tender cookies. Pumpkin Cookies with Penuche Frosting are very soft and tender, the frosting and pecans make one luscious cookie. My goodness this cookie is the most soft, tender cookie I’ve ever made. This little gem practically melts in your mouth! The Penuche Frosting fits this cookie like a glove. The frosting is made by cooking butter and brown sugar till it boils for one minute and then letting it cool for 10 minutes. After it cooled mine looked like it had firmed up on the bottom of the pan. I took it out in pieces and put it into the mixing bowl and added the milk. I let it mix until it melted beautifully into a nice tan color. I added 1 3/4 cups of powdered sugar to make a spreadable frosting to my liking. I decided to put the pecans in the recipe on top of the frosting instead of inside the batter. I thought it made a nice decoration. I pressed the pecans into the penuche lightly with my hand so they would adhere. Putting the nuts on top would be a great way to please those people that don’t care for nuts and those who do. The frosting drys to make these cookies stackable or able to be packaged up. These pumpkin cookies have found a permanent place in my recipe box, they’re incredible! Enjoy! In large bowl cream butter and sugars. Beat in egg. Add pumpkin and vanilla. Combine the flour, baking powder, baking soda, cinnamon and salt; gradually add to creamed mixture. Stir in pecans. Drop by rounded teaspoons 2 inches apart onto ungreased cookie sheets. Bake at 350 degrees for 11 to 13 minutes or until edges are lightly browned. Remove to wire rack to cool. Chelsea you’ll love these cookies! Thanks for stopping by! This is my kind of cookie. Thick and soft. YUM!!! Charlotte these cookies are amazing and very soft! I hope you get to try them! !Thank you for coming to visit! Now I know what Penuche is…Kinda! Kc just another word for “suga”! LOL!! Our boys just saw these while I was looking at your beautiful post. ALL of them asked if we can make these today?! Nicely done Bunny! Awe how sweet!! Thank you Dan! Bunny, regarding the Butter Pecan Cake Mix Cookies, when do you put in the chopped Pecans? Thank you in advance for your response. Hi Tammy, after the batter is mixed, fold the pecans in. I hope you love them!